I have been lending my A Song of Ice and Fire books to one of my friends, and he lent me this book in return. 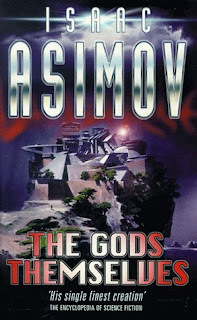 It’s the first book by Isaac Asimov that I’ve read, and it has left me wanting to read more. Yay! The book is divided into 3 sections. The first follows a scientist called Lamont, who is on a mission to discredit the scientist responsible for one of the greatest scientific breakthroughs of the time, Frederick Hallam. Hallam was responsible for setting up an Electron Pump, which trades tungsten with the beings living in a para-universe, in return for plutonium 186, a cheap, free, and clean source of energy. Lamont finds out that the pump might not be all it seems, and sets about to destroy Hallam’s reputation, a thing which proves to be extremely difficult. The second part of the story is told from the perspective of 3 different life forms in the para-universe: Dua, Odeen and Tritt. One of the joys of this section is figuring out how on earth (or, how in the para-universe) these life forms work, as they are completely different to us. So I won’t spoil any of that here. The third section is set on the moon and… well, that would be telling. 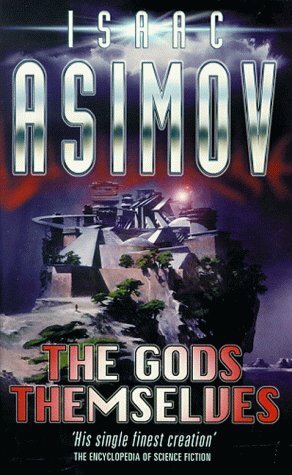 As I haven’t read any proper science fiction for years, ever since I tried out a few of the Point Sci-Fi books (remember those? Do they still exist?) that my local library had, I wasn’t sure what to expect when I started reading this. The first section starts with the sixth chapter, which is a conversation between Lamont and his co-worker, split up into bits and interspersed between the first five chapters. This I found a bit weird – not structurally, but the idea that this would be called the sixth chapter. I wonder whether that kind of structure just wasn’t common in the 1970s, and that’s why it’s done like that. Anyway, ignoring that, the first bit is interesting enough, and sets up the story quite nicely. Then we get onto the middle section… which is amazing! Now, this may be because I haven’t really read that much in this genre, but this is a million times better than I ever thought that descriptions of an alien (I guess?) life form could ever be. This section doesn’t just sit down and explain everything to the reader, but lets them figure out how these creatures and the society they live in work. It’s really, really nicely done. This all makes the third section a bit disappointing really. This starts to go into the kind of territory that I feared science fiction books would be, with the people on the moon being naked (or nearly naked) for no apparent reason (other than to write descriptions of naked women?). Not that it’s particularly lecherous, but I was a bit like… really? Really?? (It's not quite as bad as Game of Thrones though, haha). On the other hand though, there’s some nice detail about what living on the moon would actually do to humans, and the main fault of the third section is that there’s pretty much no way it could be as fascinating or as well done as the middle section. Overall, I would really recommend this book. It was really enjoyable, and I was really eager to find out what happened next when I was reading it. I started reading it on Saturday morning and had finished by Sunday afternoon, which isn’t an unknown pace for me, but doesn’t happen unless I’m really into the book that I’m reading! The only bad thing about this book is that the third section is a bit… bland compared to the second section, but even if the first and third sections were complete rubbish, I would recommend reading it just for the middle section.